Henry is a bit of a dreamer and not much of a talker.Then there's Chloe, who says what she thinks and knows how to turn a spectacular cartwheel. This is the story of how one blueberry muffin makes all the difference. Peter McCarty has written and illustrated several acclaimed books for children, including Chloe, which received four starred reviews, and Henry in Love, a New York Times Best Illustrated Book of the Year. He is also the author and illustrator of Hondo & Fabian, a Caldecott Honor Book and New York Times Best Illustrated Book of the Year, and its sequel, Fabian Escapes; T Is for Terrible; Little Bunny on the Move; and Moon Plane, a Charlotte Zolotow Award winner. Peter lives with his wife and their two children in Clinton Corners, New York, where they get lots of snow. This gentle, pitch-perfect romance will have readers’ hearts thumping with the thrill of first love. McCarty nails several aspects of grade-school life (Henry demonstrates his “best forward roll” to impress Chloe) and loads his compact sentences with meaning and longing. This gentle, pitch-perfect romance will have readers’ hearts thumping with the thrill of first love. A perfect Valentine’s Day read and a fine picture book about love and friendship the rest of the year. 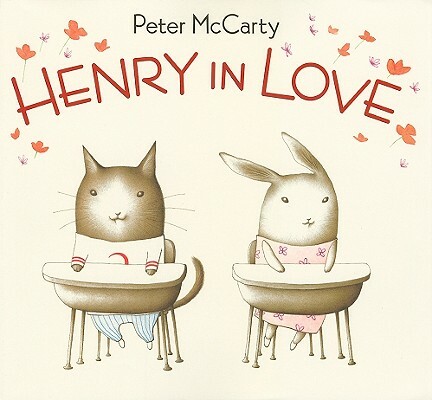 Henry in Love not only illuminates the freshness of a burgeoning friendship in the elementary school set, McCarty’s light-handedness evidences an even deeper love for the ordinary world. With precise figures placed in vignettes on a gorgeous creamy stock, McCarty tells a sweetly simple, utterly sincere schoolyard love story.